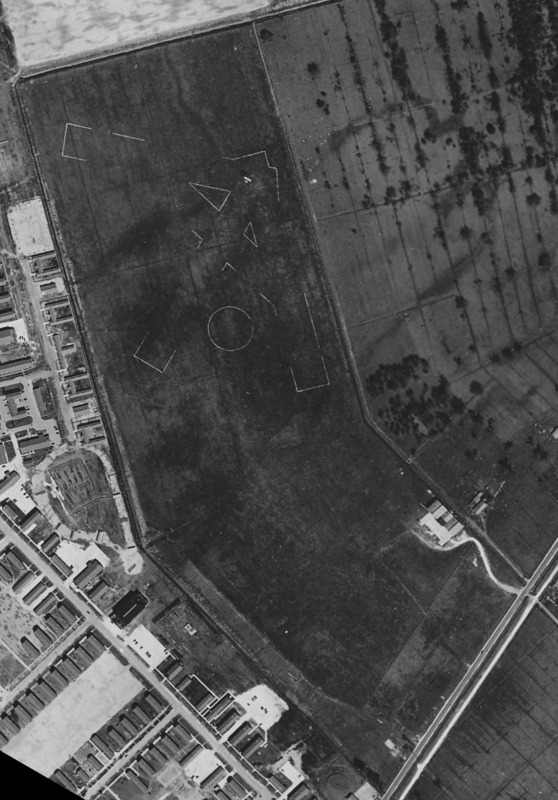 with an oval outline following the angled shape, and at least 2 aircraft visible near a single small hangar on the east side. 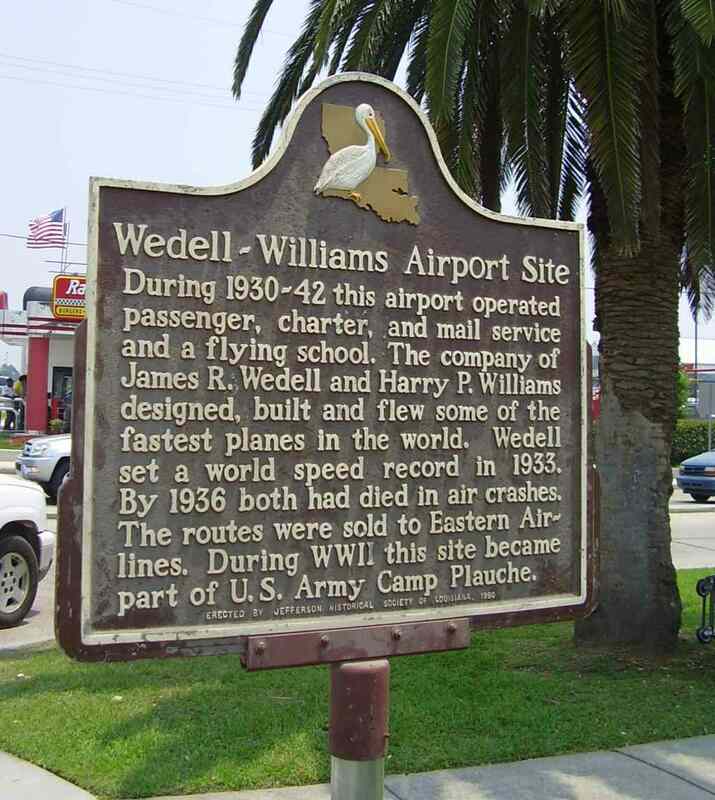 The Wedell-Williams Air Service operated flights between New Orleans & their facility in Patterson, LA. In 1930 they established the Wedell-Williams Airport, according to a historical plaque erected at the site in 1990.
was in the September 1931 Commerce Department Descriptions of Airports & Landing Fields (according to David Brooks). It described Wedell-Williams Airport as a commercial airport consisting of an iregularly-shaped 142-acre sod field. The field was said to have 2 runways, with the longest being 2,600'. 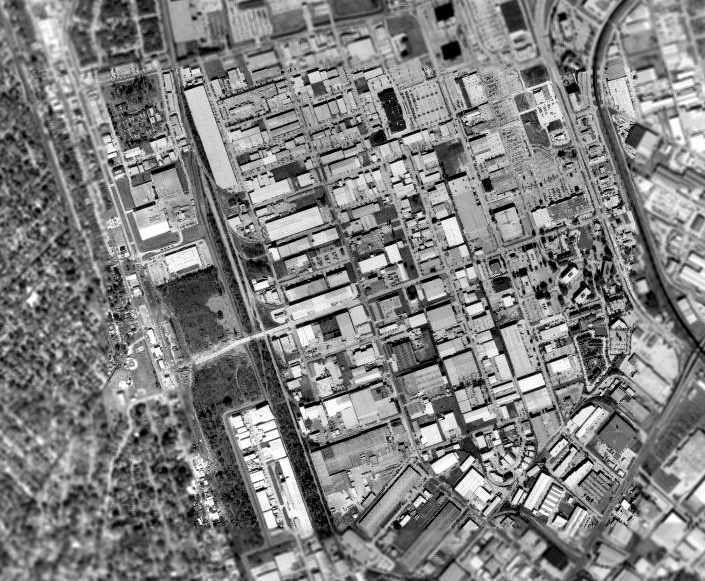 was an August 1933 aerial view (courtesy of John Anderson, Director of LSU's Cartographic Information Center). was on the 1934 Navy Aviation Chart V-242 (courtesy of Chris Kennedy). 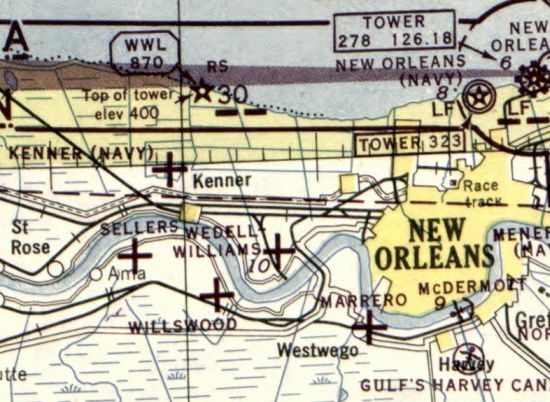 Wedell-Williams Airport, as depicted on the 1935 New Orleans Sectional Chart. 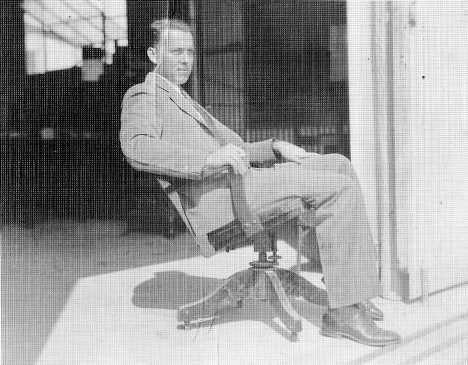 An undated photo of Raymond Braud at the Wedell-Williams Airport. “Braud was the airport manager there & remained until Wedell-Williams was purchased by Eastern in 1936”. By 1936 both founders of the Wedell-Williams company had died in air crashes, according to a historical plaque erected at the site in 1990.
and situated only 6 feet above sea level. The field was said to consist of a 90 acre rectangular sod field. The photo showed what could have been a single building on the east side of the field. and having a single small building on the east side. to support flight training operations at NAS New Orleans. According to Brian Rehwinkel, “The Navy began using the field in 1942 after the US Government used (according to Navy documents) a rather unconventional way of acquiring use of the field. and all of the structures & improvements on the property were taken (bought) by the government. and all of the structures & any improvements (including the 2 metal hangars) became government property. 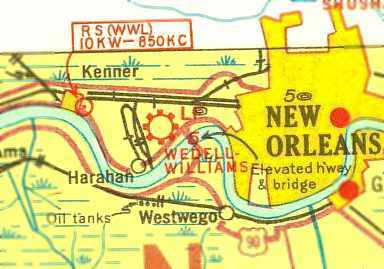 depicted “New Orleans NAS Auxiliary (22508 Wedell-Williams Outlying Field)” as an open grass area. was a 3/9/44 USN aerial view (from the National Archives, courtesy of Brian Rehwinkel). and three grass runways marked on the northwest side. A single-engine biplane was visible as just having taken off, visible over the northeast end of the southwest/northeast runway. indicated that the Wedell-Williams Airport conducted Navy flight operations. 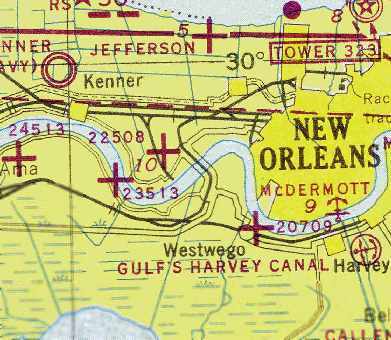 The field was said to be located 5.5 miles west of New Orleans, and to have a 3,800' unpaved runway. and the numbering indicated that this field was located 225 degrees from the parent airfield, at a distance of 08 miles. According to Brian Rehwinkel, “The Navy used the field until sometime before September 1994 when it was determined the field was no longer needed by the Navy. as a 118 acre rectangular property containing a 3,210' x 2,057' all-way sod landing area. The last aeronautical chart depiction which has been located of Wedell-Williams was on the January 1945 Beaumount Sectional Chart. 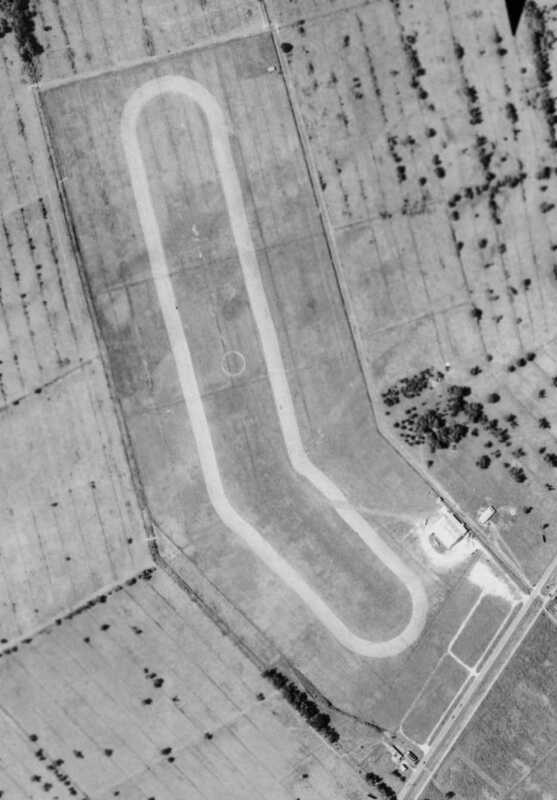 It depicted Wedell-Williams as an auxiliary airfield. 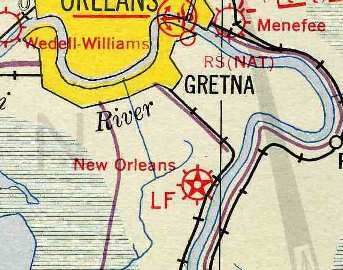 Wedell-Williams evidently closed in early 1945, as it was no longer depicted on the July 1945 Beaumont Sectional Chart. 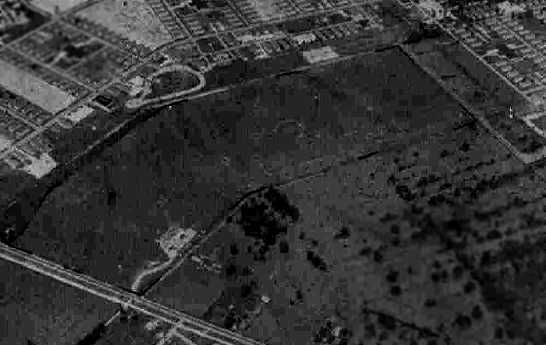 A November 1945 aerial photo (courtesy of John Anderson) of Wedell-Williams Airport. 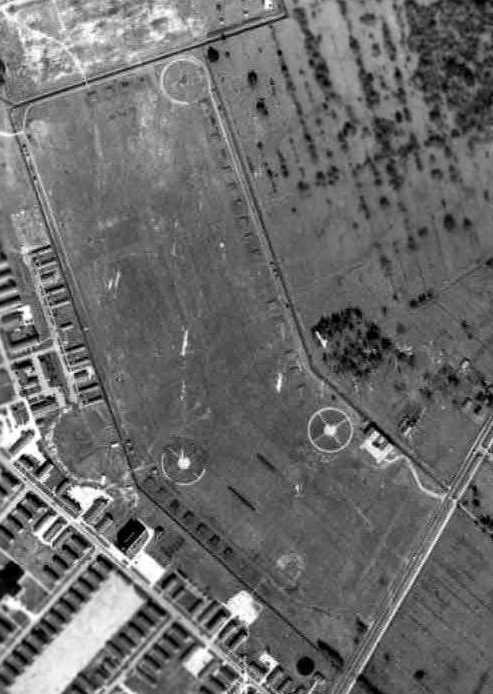 What were the 3 large circular formations that had been added to the airport property? 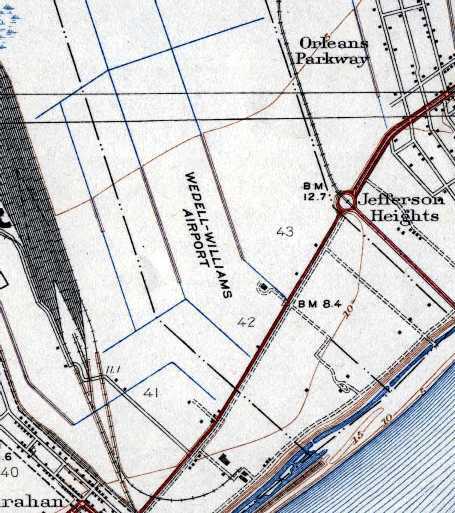 and 2 large industrial buildings had been built on the southeastern part of the former airfield. The northwestern portion remained a clear grass field. A historical plaque was erected at the site of Wedell-Williams Airport in 1990.
and no recognizable trace of a former airport appears to remain. An undated (pre-2013) photo of a historical plaque erected in 1990 at the site of Wedell-Williams Airport. 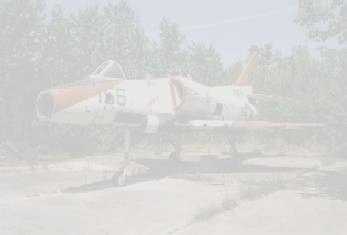 Wedell-Williams Airport was was located east of the intersection of Hickory Avenue & 10th Street.